This review is idiosyncratic, focusing on presentations that blog readers might find interesting. My apologies to authors I leave out or treat briefly -- all the presentations were action-packed and even my verbose blogging style can't cover everything. "Nobel" in the title has a great convening power! The list of famous economists attending is impressive. And each presenter put great effort into explaining what they were doing, in part on wise invitation from the organizers to keep it accessible. As a result I understood far more than I do from usual 20 minute conference presentations and 15 minute discussions. The first day was really "banking day," giving a whirlwind tour of the financial economics of banking. The big change is that lenders are not treating banks as too big to fail any more. They are charging credit spreads even to the big banks, so that trades that make the bank safer really do affect banks cost of funding. You can see this in the credit spreads of the first graph. My comment: before you jump to "regulation is impeding arbitrage! Get rid of regulations and go back to too big to fail so bank debt is riskfree" remember there is another way. If banks have lots and lots more capital, so they can't conceivably default on their debt, then the debt is already riskfree and the overhang mechanism goes away. 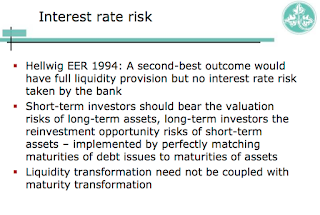 My comment: I'm less persuaded that the "reasons why short term debt is needed" apply anymore. More following Gorton. 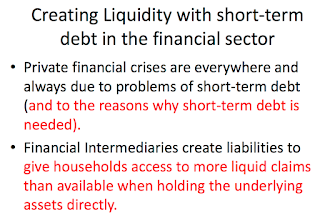 Nobu Kiotaki managed to clearly present an entire model of liquidity creation in his 20 minutes (Slides, video), and Emmanuel Farhi (slides, video) nicely combined policy big picture and modern High Theory mechanism design. 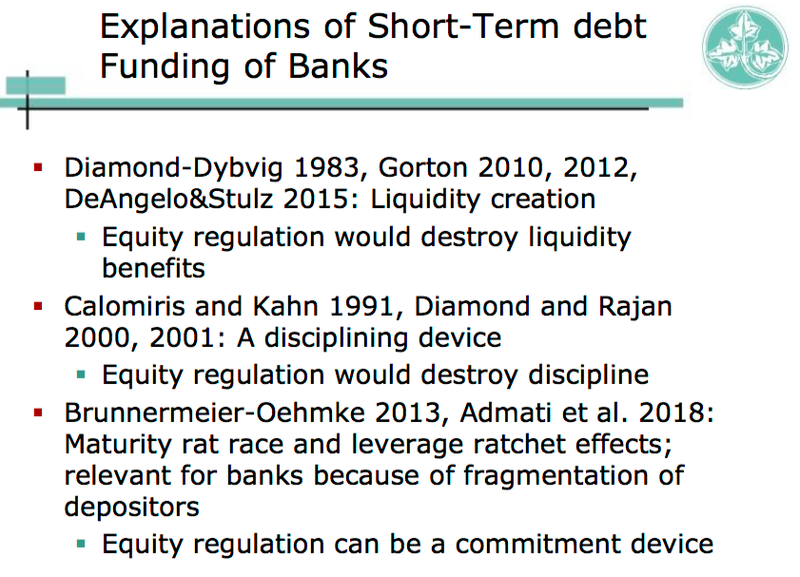 Raghu Rajan (slides, video) gave a nice overview of regulation, particularly accessible to policy-makers. He ends with the contentious issues of the day, including "macro-prudential" regulation, in which monetary policy and regulation are mixed, central bankers try (finally, this time, we promise) to tighten credit as the cycle builds up. 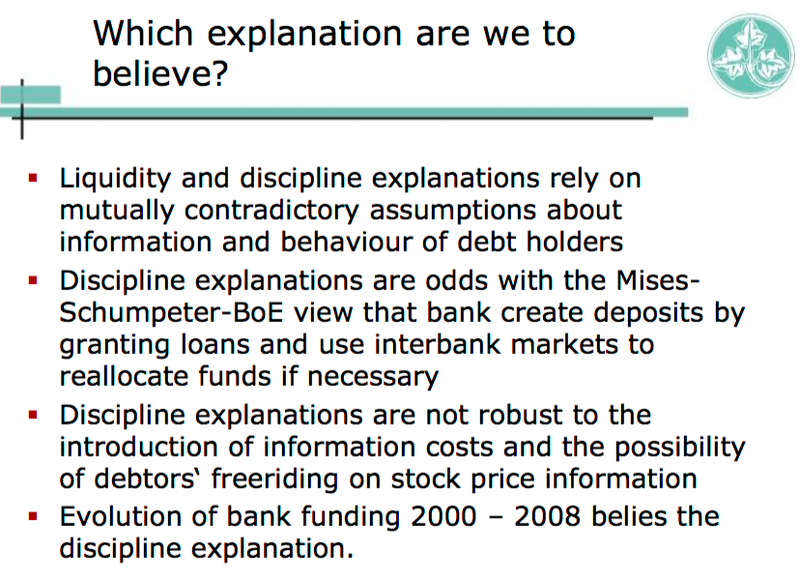 Gary Gorton (slides, video) explained his view of debt as a generally information-insensitive, money-like asset. Short term debt is, as graphed, usually very far from default. Thus, information about the fundamental value of the underlying firm or asset has very little impact on the value of debt. To Gorton that's the point of debt. 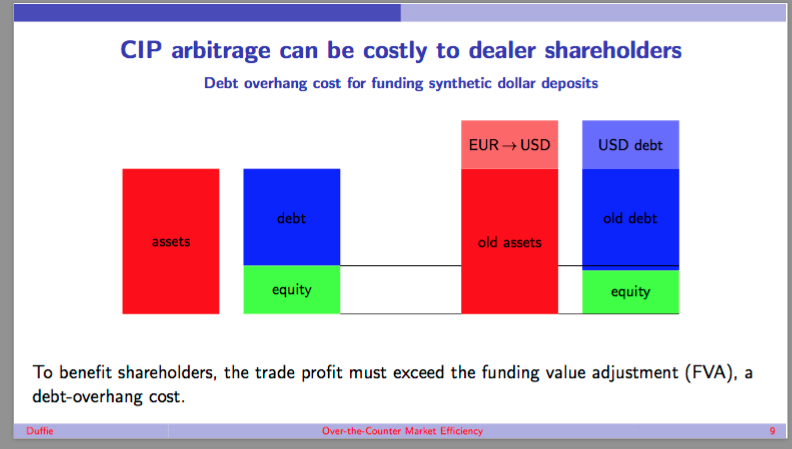 There is in modern times no asymmetric information about the value of money, so no bid-ask spread and high liquidity. Except after bad news, then debt gets closer to the boundary, and more importantly people who haven't been paying any attention start to pay attention. 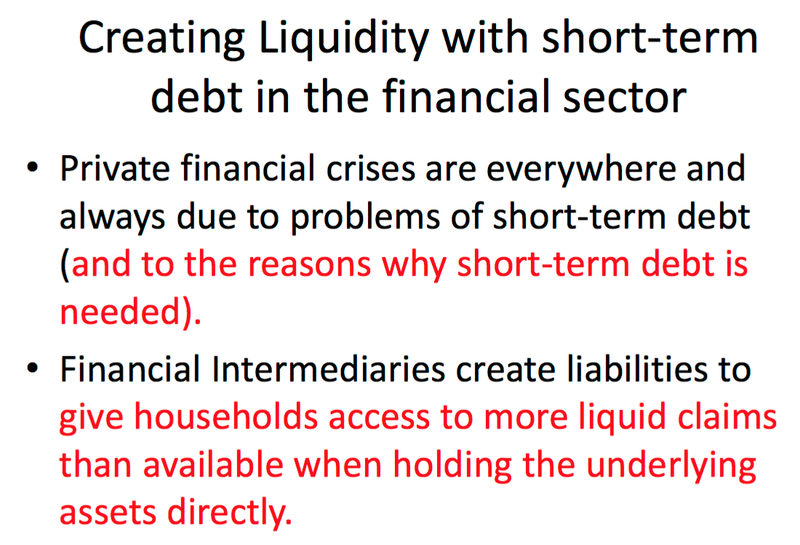 Debt becomes illiquid, due to fear of asymmetric information, and everyone wants a limited supply of money. A crisis follows. I find this a compelling story for the financial crisis and crises in general. But it is quite different than the type of bank run Doug Diamond describes. Most importantly, there is a deep tension between Diamond and Rajan's view and Gorton's view. Diamond and Rajan say that debt is necessary, because it disciplines managers. Debt holders are constantly monitoring management, and running at the first sign of trouble. In direct contrast, Gorton's debt holders are paying no attention at all most of the time, and then dump debt out of blind fear. One weak spot of the conference was that everyone was being too polite. Well, everyone but me. Here we have a glaring difference in views. Which is right? I asked the question. Rajan's response was very informative: Yes, most retail debt customers are "information insensitive," and likely even most corporate treasuries using repo as a cash substitute. But among the New York banks who are funding each other very short term, yes indeed they are paying a lot of attention and will run when they see trouble. So the "discipline" story is narrow, for this class of lender and borrower. That seemed to me a nice reconciliation of dramatically opposing views that has troubled me for some time. Martin Hellwig (slides, presentation) and Amit Seru (slides) gave interesting discussions. Hellwig pointed out the heavily US-centric program, and the US centric view of the facts everyone was bringing to bear. No surprise, he emphasized more equity as a solution to lots of problems. The Gorton information sensitivity problem goes away with much more equity. He investigated the central question -- why is there so much short-term funding? Equity, always more equity. Fixed value, first-come-first-serve, debt is the key to crises. 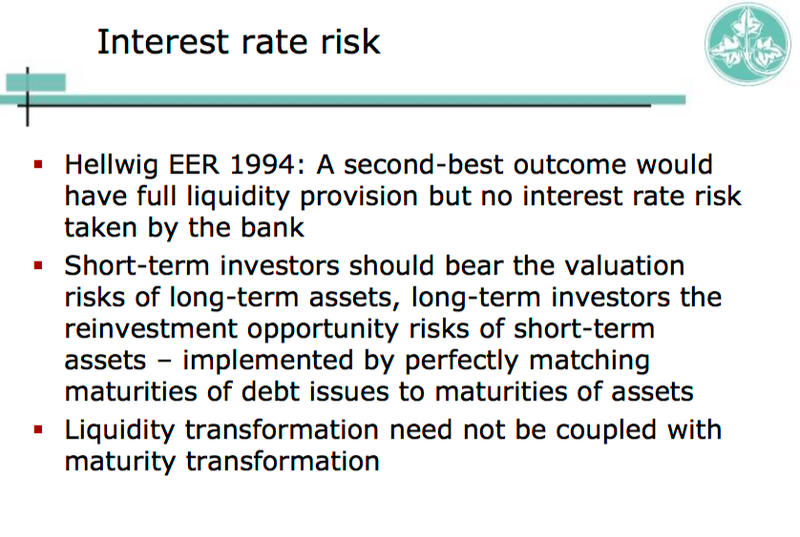 Hellwig also points out there is no reason people need fixed value debt -- that liquidity provision need not mean maturity "transformation." Seru told many good stories based on his research of regulatory misbehavior. The picture of detached technocratic experts dispassionately dispensing macro-prudental dirigisme is at odds with how regulators actually behave. Ken Rogoff gave one of the most stirring presentations of the day. 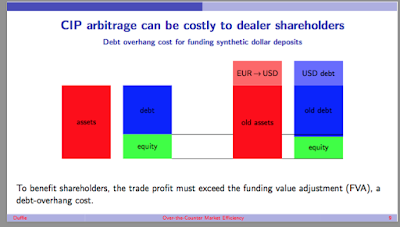 (Slides, a bit overstuffed, and video, recommended) Beware sovereign debt! Sovereigns default even with low levels of sovereign debt. Internal, private debt has been often ignored, and it can be as large as sovereign debt. It also triggers sovereign default, as the sovereign tries to bail out large private debts. 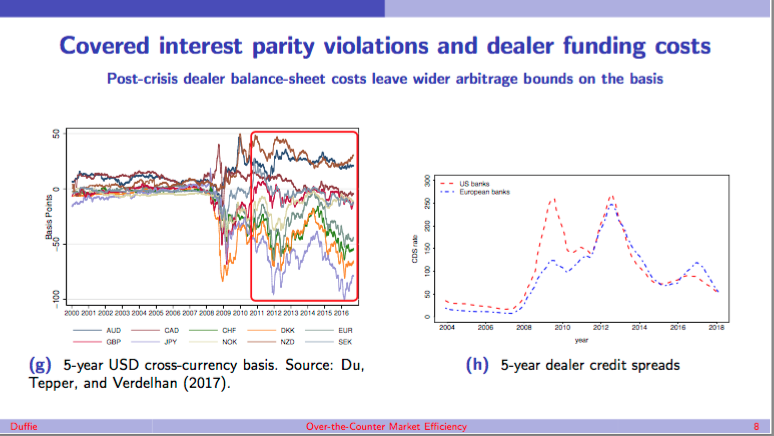 • In many countries, high government, private and external debt, as well as unfunded pension liabilities (“Quadruple overhang” ...) Return of fiscal dominance/financial repression/de facto default cannot be ruled out. • Even US engaged in domestic default in 1933...The financial repression of the 1950s and 1960s and the high inflation 1970s almost amounted to de factor default. In case you're not hearing the loud ringing of the fire bell here, the US, Europe and Japan have dramatically increased public debts since the financial crisis. Entitlements mean no end is in sight. Yet we are also counting on trillions of bailout, stimulus, anti-recession spending if there is another crisis, and our governments might have to try to borrow a lot if there is a war, massive cyber attack, pandemic, etc. Eventually they cannot borrow. The fire house has burned down. And I thought I was a debt and deficit hawk! I found myself disagreeing a bit on Ken's prescriptions, which I found inconsistent. Well, since day 1 I have argued Greece should default so I don't have an argument there. But "recapitalization" means northern taxpayers bail out their banks. That adds to the fiscal burden, no? 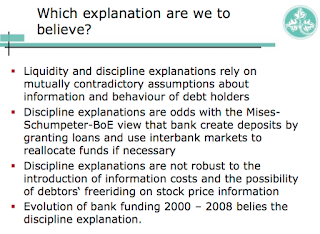 Likewise, Ken's presentation argued for much wider bailouts in response to financial crises. But, more bailouts means more debt and less fiscal space, no? And some praise for "austerity," at least on the reducing government spending end, follows logically from Ken's warning about fiscal space, though Ken didn't mention that at all. Many populist leaders and academics contend that advanced countries are highly unlikely to face out‐of‐the‐box events leading to fiscal stress. Unfortunately this view is both dangerous and stupefyingly naïve, prime example of “This Time is Different” mentality. Aside from future systemic financial crises, there are new age risks such as cyberwar, pandemics, CRISPER‐ enabled biological terrorism, etc. Well it's not just populist leaders and academics (whoever the latter are)! I don't recall the Obama years as one of great alarm over mounting debt, especially from the left. Paul Krugman was making fun of debt hawks constantly until Nov 6 2017. Larry Summers (with Greenwood, Hanson, and Rudolph) argued the government should borrow short term, as a rise in interest rates which would raise interest costs is so unlikely to happen. I found Ken's presentation a standout for another reason too. For the rest of the discussion, history seemed to have stopped in March 2009. (Except for pretty nebulous talk about internationally coordinated macro-prudential policy and other dreams.) The study of banking seems to have frozen into the study of the financial crisis. Nobody else was saying anything about what are the problems that we are ignoring now, as we ignored housing and subprime in 2006-2007, or where the next crisis will come from. Even Luigi Zingales, who in the Monday discussion excoriated all of the economics profession and policy community for having its heads in the sand in 2007, said nothing about what are the unheralded dangers today. Ken did, loudly, clearly, and uniquely. Again, I'm sorry for not mentioning all the presentations, as they were all great. Loans result from purchase of unexpected surplus. Deposits when unexpected scarcity reduces purchases. All observers see the same tradebook error; purchases are asynchronous an no view of current sales is more accurate than the round robin observation times. 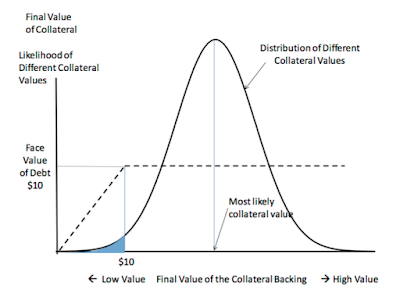 The banker function is to make loans/deposits valid by matching the asynchronous queue of deposits to loans with a market making error bound by the tradebook error. The real goods buy and sell queues become stable, due to interest charge effect, meaning, by definition, supply stabilized to demand and relative pricing is working. Well, too much to shake a stick at here, but a couple comments. 1. Why, oh why, when the US spent $16 trillion (conservatively) on "national security" through the Bush and Obama years, are government outlay problems are laid only to entitlements? 2. Yes, forget about a balanced US federal budget (in fact Trump is surging military outlays also). GOP/Dems, forget about it. Yes, entitlements play a large role (although payroll taxes mostly handle it. Income taxes are what finance the "national security" outlays, and we cut income taxes). Okay, so now what? Do not say "Fiscal responsibility." that answer is not there. 1. Moderate inflation? 4% a year, and "pay off" debt that way? Remember, the Reaganauts said inflation under 5% was a win. Why the fixation now for 2% inflation? 2. Steady state QE, and keep transferring national IOUs to the Fed? Well, it works in Japan. They have no or little inflation, and the Bank of Japan owns 45% of the national debt. Call it Mobius-strip economics. The government of Japan owes money to the government of Japan. 3. Money-financed fiscal programs? Why borrow anymore? 4. Move all your financial assets to Switzerland? 5. Given "CRISPER‐ enabled biological terrorism" ponder moving to a better planet? "Moderate inflation? 4% a year, and "pay off" debt that way?" What say you to QE or money financed fiscal programs? Remember, fiscal responsibility is not an option. 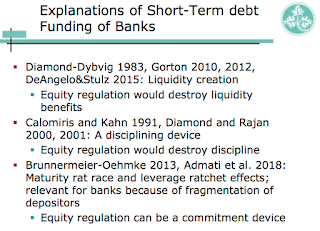 That's great that people are thinking through issues such as regulations, sovereign debt risks, asset-liability mismatch risks, shadow banking risks, etc., and thanks for taking the time to summarize the presentations. 2) the most important principle of economic volatility - both business cycle and inflation volatility - is that bank-created money injects fresh purchasing power into the circular flow, thereby directly boosting nominal GDP, and that process reverses when credit markets go sour. Both points are well supported by data and observation (see the links below), but unfortunately rarely discussed or even admitted at conferences such as the symposium blogged above. "Ken Rogoff gave one of the most stirring presentations of the day. (Slides, a bit overstuffed, and video, recommended"
The two links are to the same pdf document. Was that intended or was the second one to a youtube video?